St Vincent’s Clinic is next door to St Vincent’s Private Hospital on the corner of Oxford and Victoria Streets Darlinghurst. 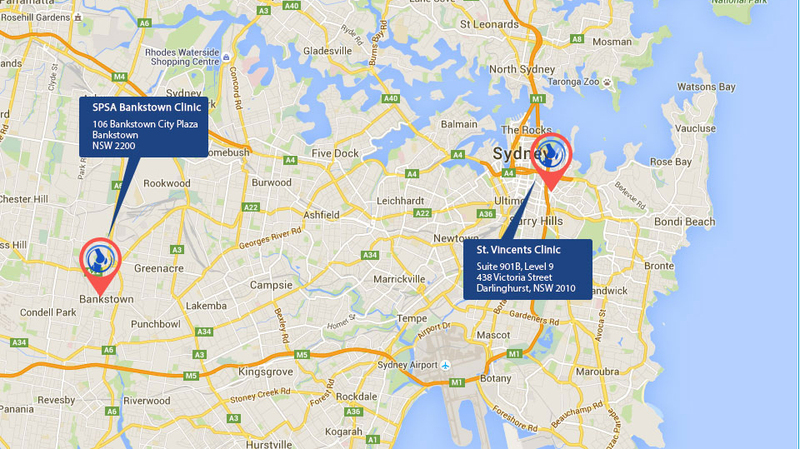 The clinic is easily accessible by public transport. There is paid onsite parking and limited metered street parking in the streets around the clinic. For rail and bus information, contact the Transport Information Line on 131 500 or visit transportnsw.info . You will have to walk from the station to the Clinic or hail a taxi. A taxi telephone with a direct line to a booking service is located in the foyer of the Clinic. You can also hail a taxi on Oxford Street or Victoria Street. Patients from rural and regional areas requiring transport can telephone the Sisters of Charity Outreach Country Care Link for information and assistance. Patients attending Day Surgery Unit (DSU) in Level 3 and Radiotherapy are entitled to a subsidised flat rate of $12.00 after two hours. Tickets must be validated at the Day Surgery Unit and Radiotherapy before payment is made at the pay stations on Level 2 and Level 4 by cash or credit card, or by credit card on exit. Dedicated car spaces for disabled or mobility restricted people with vehicles displaying mobility assistance stickers are located on level one of the St Vincent’s Clinic car park. Entry is via Barcom Avenue behind the Clinic. There are also a limited number of dedicated disabled parking spaces on Victoria Street. There is a drop off zone on a level area at the entrance to St Vincent’s Clinic in Victoria Street. There is also a drop off zone at the entrance to St Vincent’s Private Hospital next door to St Vincent’s Clinic in Victoria Street. Limited meter parking is also available on the streets near the Clinic. 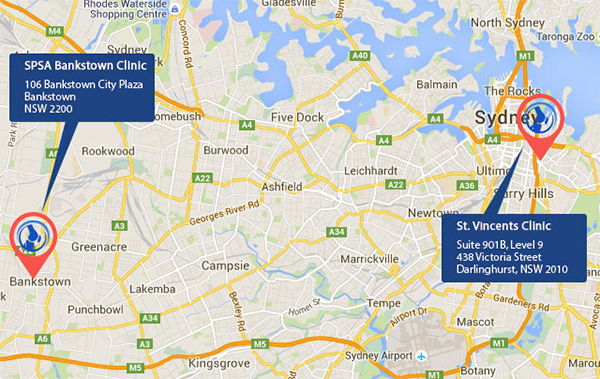 The SPSA Bankstown Clinic is located at 106 Bankstown City Plaza. This is a one-way road that comes off the corner of Marion Street and Chapel Road. We are located on the ground floor of this building. The SPSA Bankstown Clinic is located next door to the Bankstown Hotel with the North Terrace Fish Markets on the other corner. On street parking is limited. Parking can be found nearby in the Marion Street Carpark or the Centro Shopping Centre.